Risk appetite, as portrayed by these weekly index charts, stabilized this week. That’s not surprising given that both military actions and sanctions have been within expectations, so fears of further escalation remain real but subdued. Overall, European indexes actually climbed throughout the week as this idea became more widespread. The weekly chart shows the pair pulled back, and the daily chart clarifies why. The daily chart shows that almost all of the move lower happened on Wednesday, with a bit more on Thursday, implying that the events of these days, discussed below, were the key EURUSD drivers. Momentum on a weekly basis remains firmly upward, as shown by the pair remaining within its double Bollinger ®band buy zone. The shorter term daily chart shows the pair in the neutral zone. 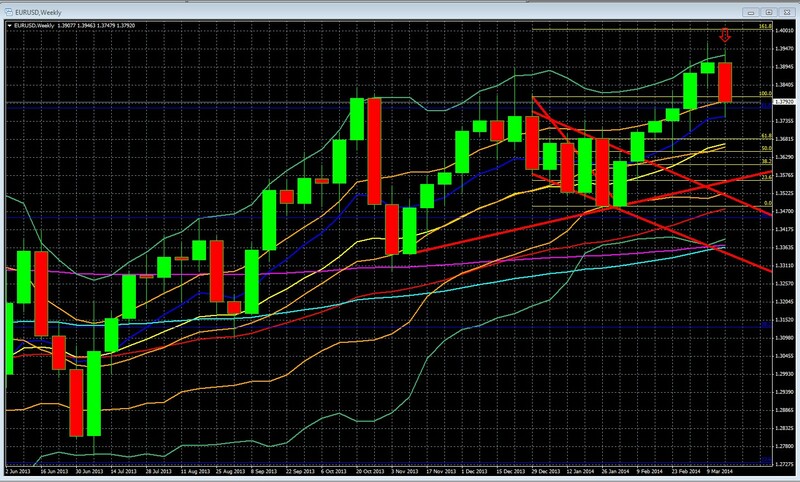 Support at 1.3790 (reinforced by the 100% fib retracement and lower end of the double Bollinger band buy zone). Note that we’ve updated and revised this introduction to double Bollinger ® bands, so anyone needing an intro or review should review it. EURUSD Weekly Uptrend Intact: Indeed the week’s close is still higher than the most recent weekly low of 3 weeks ago, so the uptrend is alive, along with the strong momentum. Conclusion: short term neutral, long term remains bullish until we get a confirmed move below the buy zone. Given that the pair is already at strong near term support, a material move lower is unlikely barring a surprise bearish event. See below for how the coming week’s fundamental drivers are likely to move the pair. On Wednesday Janet Yellen surprised markets with a somewhat faster rate hike schedule than had been anticipated. That shifted rate forecasts higher, and so the USD popped vs. the EUR. Thursday saw some follow through from that move, aided by positive US jobs and manufacturing data that outweighed a slight miss on existing home sales. This is an ominous development for the longer term, but unlikely to hurt the pair in the near term. In the near term, the biggest threat to the pair could be from the ECB itself. –Two weeks ago the ECB made clear that it’s holding policy steady, but that Draghi is concerned about EUR strength exacerbating both deflation and weak EU growth. –Recent Data Hasn’t Helped: Last week we saw that Euro-Zone inflation slipped back to a post-2008 crisis low of +0.7% y/y, the level at which the ECB last decided to cut its main refinancing rate in November 2013. Economic data out of the Euro-Zone has been weaker recently. This makes the coming week’s EU flash PMI’s all the more important. –Meanwhile the Fed continues its slow move towards tightening, as shown by Yellen’s indicating a rate hike by mid-2015, and her implied message that it might come sooner if US data surprises to the upside, as it well might now that the bad weather excuse is fading away with Spring’s approach. –Threat Of Reduced EU Credit Availability: With LTRO repayments continuing, that means a further reduction in liquidity. Add this to the above noted softer economic data and renewed speculation over the Fed winding down its stimulus measures and raising rates sooner than expected, and we could see further cuts in inflation and lending in the EU. –EUR Long Positions Crowded: The CFTC’s COT data shows Euro longs increased by +45.6% to 52,991 contracts for the week ended March 18, 2014. Speculators haven’t been this bullish on the Euro since the week ended October 29, 2013. That was the EURUSD’s prior highpoint and was followed by a pullback from which the pair did not recover until a few weeks ago. Although the CFTC data is old by the time we get it, this time it’s confirmed by out real-time sample. See below for details. The outstanding recent bearish development this week was the EU Parliament’s agreeing to a single bank resolution mechanism (SRM) deal with representatives of the EZ’s member states. As we we’ve warned repeatedly (for example here and here), the original draft agreement concocted by the member states is dangerously flawed. US Treasury Secretary Lew called it too slow and too underfunded. The EU Parliament managed to wring a few concessions from Germany that leaves the current SRM pact a bit less slow and underfunded, but that’s all. Like Draghi’s OMT program, the EU’s best hope for the SRM deal is that is isn’t needed. For full details see our special report here. –Fed Backpedaling On Rate Increase Expectations? : Little sign of follow through for USD rates, and thus the USD: In response to Yellen’s remarks about rate hikes in mid-2015, traders pumped up the 2-year US Treasury Note yield to its highest one-day advance in nearly four years. Fed officials and other commentators have been downplaying her remarks, suggesting that they in fact don’t suggest any acceleration in the Fed’s rate increase time table. Those comments undercut chances for further USD gains, and that lack of follow-through the rest of the week leaves the US currency vulnerable to further retracements vs. the EUR and other currencies. It’s a typical late month light calendar. As noted above, EU flash PMIs and the German Ifo survey could be important if they reinforce or reduce the growing theme of weak EU data. The following week the tempo picks up with US jobs and related reports and the ECB rate statement, as well as with anticipation of Q1 2014 earnings season, which begins in the second week of April with Alcoa (AA) announcing on April 8th. China HSBC flash mfg PMI – the latest update on the China slowdown story. EZ: French, German, EZ flash (preliminary) mfg and services PMIs. These could reinforce or balance the recent picture of deteriorating EZ economic data. EUR: German preliminary CPI – important if it shows deflation a German problem too, which could make Germany more receptive to easier ECB policy. 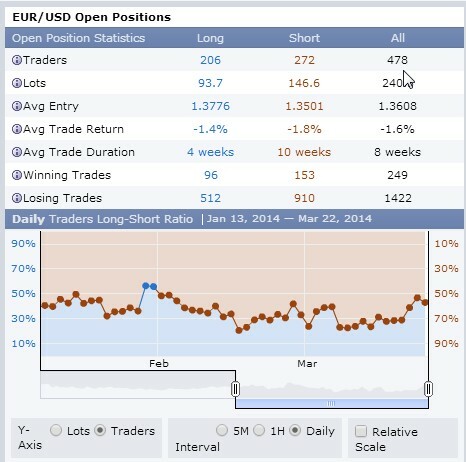 As noted above, the most recent (as of March 18th) EURUSD trader positioning shows the long position is crowded. Our real time sample below shows the same, suggesting that the long EURUSD position remains overbought. While such situations can persist and so are hard to time, they do suggest potential for a fast reversal as weak hands rush for the exits at the first sign of trouble. The number of traders in this sample has remained steady, just below 500, so the spike in long positions (43%, up from 28% last week shown here) is not due to shorts closing positions. Fundamental Outlook: neutral near term, bearish longer term. We anticipate a test of lower support in the 1.3750 area, but don’t see a break below 1.3730. 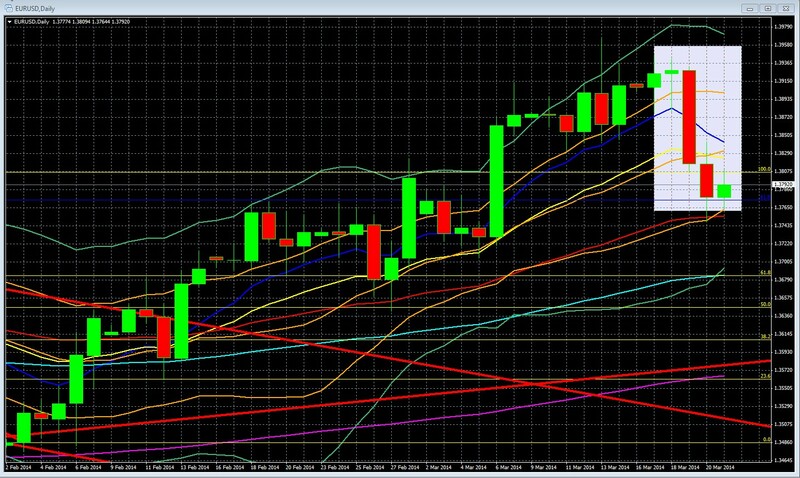 Gains should remain capped around 1.3900. The net effect of technical and fundamental drivers this week suggests more range bound trade. This relative calm is likely to give way in the following week that packs a both a more potent calendar and approaching Q1 earnings. If there is a big move in the EURUSD, it’s not coming from the calendar or technical setups. Rather it would come from some surprise via the relevant central banks or new geopolitical events.